My team slogan for my pee wee football team is “Play for Fun but Win for the Team.” I always loved to play football, I wanted to win but as a young football player I knew that I did not have control over the other players and the outcome of the game. I had to do my best and hope that everyone was doing the same. I was lucky, at the Pee Wee level we went undefeated for many years and we lost maybe 6 games in a 5 year time span. When I reached Jr High, I played on average teams and in High School we had losing records all but one year. The High School was a new HS in our school district, so our HS football program started from scratch, which was tough, especially in our Texas 5A district. But, at least as a Pee Wee player I felt what it was like to win. And winning is funner. 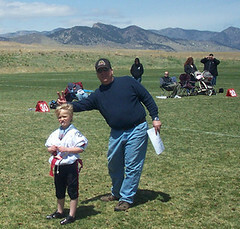 Last year, I fielded a Pee Wee flag football team. It was about half of my tackle team. I told the kids we would win the first half and play for fun in the second half and not worry about the final score. This was a great strategy, so I thought, until the 4th game when we officially lost, because we played for fun in the second half. The players were so unhappy about losing, even though we all agreed before the season on our second half play for fun strategy. The players took a vote after that loss that they did not want to lose any game because of our fun strategy. I was very surprised, because the lineman and 3rd string backs who I rotated in at backs during the second half fun game voted unanimously to play to win. They did not care about rotating in to run the ball, if that meant they might lose the game. I learned a lot that day about all of the recent theories about competition for young players. Kid’s like competition and want to keep score. They like the challenge that sports offers them. Life is a competition and we should not water down sports just so everyone can get a trophy. I relearned that fact from my flag football players. Play for Fun, but Winning is Funner! Last season our team lost 2 regular season games and lost in the championship game, but we will get to that in a sec. We tried to teach both good sportsmanship and proper football technique and skills. We had an issue with a coach in our league that appeared to do anything to win. Having been frustrated by being unable to beat us in the regular season, when we met this team in the championship game, 3 of the linemen appeared to have gained about 20 lbs. They went from having 1 large lineman and 4 average linemen to 4 large and 1 average. We played 3 times in the regular season, including the last game of the season. So we knew eachothers teams pretty well. One of the new linemen even brought a different colored jersey, as he had another game later, but we had no copy of a roster from before the playoffs or during that game. So we could prove nothing. Then as if that was not enough, he blitzed all 11 players on def ever play. Help me to understand how this is teaching kids the proper way to play football. Because I don’t understand it. What can be done to stop the roster swap? Form a league comitee and register the roster with them at the start of the season? Our team may even go to a different league next season, as apparently these types of things happen frequently with this particular team and their coach. I don’t understand the need to cheat, as all 3 previous games were close, 6 points or less with the last being won in overtime. The teams were already well matched. I love your thoughts concerning youth sports. You took the words right out of my mouth concerning “so everyone can get a trophy” comment. I am trying to install that train of thought in my area as well.